If you read this column completely and carefully today, you will learn about the true state of the scientific debate over global warming. You will not get the truth about that from the Washington Post, the New York Times, or the rest of the self-regarded "establishment" media. They are devoted to the fun and games of play acting as if there is no legitimate scientific debate over whether mankind's use of low cost, reliable energy from oil, coal and natural gas portends catastrophic global warming that threatens life on the planet as we know it. Recently, the media Knights Templar of the religious orthodoxy of man-caused global warming made a contrived pass at reviving flagging public respect for their fading catechism. The occasion was massively overhyped and misrepresented reporting of the Berkeley Earth Surface Temperature (BEST) project. But all that was new from that project was the departures from the official catechism. The project reported only on the recorded temperature history since 1950 from temperature stations on land, which covers less than 30% of the earth's surface. As the project leader Berkeley Professor Richard Muller reported in a Wall Street Journal commentary on October 21, after obtaining and reviewing "more than 1.6 billion measurements from 39,000 [land based] temperature stations around the world... the result showed [drum roll please] a temperature increase similar to that found by other groups." Those are most prominently NASA and the National Oceanic and Atmospheric Administration in the U.S., and the Met Office and Climatic Research Unit in the United Kingdom. In other words, that is nothing new. But this review and confirmation of the established land based temperature records that everyone working on the issue is familiar with was widely celebrated in the liberal/left Democrat Party controlled media as definitive new proof of the truth of the man-caused global warming religion. Muller, however, was more intellectually honest than any of them in confessing in the Journal article that the BEST project involves no independent assessment of the question of "how much of the warming is due to humans and what will be the likely effects." But that is the whole issue in the global warming debate. Muller also honestly admits that "The [land based] temperature station quality is largely awful," noting that "A careful survey of these stations by a team led by meteorologist Anthony Watts showed that 70% of these stations have such poor siting that, by the U.S. government's own measure, they result in temperature uncertainties of between two and five degrees Celsius or more. We do not know how much worse are the stations in the developing world." He adds that, "The margin of error for the stations is at least three times larger than the estimated warming." He also admits that the land based temperature records are corrupted by urban heat island distortions which are constantly growing over time, building in a warming bias. He recognizes that the established temperature authorities mentioned above today use data from only about 2,000 weather stations, down from 6,000 in 1970, which raises questions about their selections among available sites. Moreover, Muller admits the recognized temperature authorities try to homogenize the temperature records from the thousands of temperature stations around the globe to come up with a summary statistic of the degree of global warming, and serious questions can be raised as to how to do that, disputing a large portion of the warming attributed to humans. Muller also confesses that one-third of land based temperature stations worldwide show cooling rather than warming. These concessions are important to recount because of more basic problems with the established land based temperature record that Muller doesn't confess. Weather satellites measuring atmospheric temperatures worldwide, over land and water, which are not subject to the above troubles of land based weather stations, show no warming since their record began in 1979, and before that there was actually global cooling dating back to 1940. The satellite record regarding atmospheric temperatures is independently confirmed by weather balloons. Moreover, the computer based climate models utilized by the UN's own Intergovernmental Panel on Climate Change (IPCC), and the atmospheric theory they rely upon, all insist that if man's use of carbon based fuels was warming the planet, the atmosphere must be warming faster than the surface. In addition, the scientifically recognized temperature proxy data from tree rings, ice cores, lake and ocean sediments, and stalagmites also show no warming since 1940. Note that the warming before 1940 is attributable to the global recovery of temperatures from the Little Ice Age, and even the land based records show no warming over the last 13 years. Fred Singer concludes as a result "It is very likely that the reported warming during 1978-97 [from land based weather stations] is simply an artifact -- the result of the measurement scheme rather than an actual warming." When Singer sent a letter to the editor to the global warming cheerleading Washington Post, pointing out the above anomalies and his conclusion, he reports the peculiar response that "they were willing to publish my letter, but not my credentials as emeritus professor at the University of Virginia and former director of the U.S. Weather Satellite Service. Apparently, they were concerned that readers might gain the impression that I knew something about climate." But there is more. Even the land based temperature record is not consistent with the theory of man-caused global warming. That record does not show persistent warming following persistent growth of CO2 and other greenhouse gases. Rather, it shows an up and down pattern of temperatures more consistent with natural causes. Those include solar flare and sun spot cycles, and the periodic cycling of warm and cold water in the oceans from top to bottom, particularly the Pacific Decadal Oscillation (PDO). The truth is a vigorous global scientific debate persists over whether man's use of carbon-based fuels threatens to cause catastrophic global warming, and the media not reporting that is not performing journalism. The most authoritative presentation of this debate can be found in the 856 page Climate Change Reconsidered, published by the Heartland Institute in 2009. This careful, thoroughly scientific volume co- authored by dozens of fully credentialed scientists comprehensively addresses every aspect of global warming, and indicates that natural causes are primarily responsible for climate patterns of the last century. Heartland has just published a follow up 416 page Interim Report updating the debate. When you run across a Knight Templar threatening you with a lance and a sword unless you confess the truth of catastrophic man caused global warming, ask him for his rebuttal to Climate Change Reconsidered. You will find the effect is like showing a cross to a vampire. Indeed, the latest and best work actually provides scientific proof that the man-caused global warming catechism is false. Fully documented work by Roy Spencer, U.S. Science Team Leader for the AMSR-E instrument flying on NASA's Aqua satellite, and Principal Research Scientist for the Earth Systems Science Center at the University of Alabama at Huntsville, shows using atmospheric temperature data from NASA's Terra satellite that much more heat escapes back out to space than is assumed captured in the atmosphere by greenhouse effects under the UN's theoretical climate models. This explains why the warming temperature changes predicted by the UN's global warming models over the past 20 years have been so much greater than the actual measured temperature changes. In August, 2011 came the results of a major experiment by the European Organization for Nuclear Research (CERN), involving 63 scientists from 17 European and U.S. institutes. The results show that the sun's cosmic rays resulting from sunspots have a much greater effect on Earth's temperatures through their effect on cloud cover than the UN's global warming models have been assuming. This helps to explain why the historical pattern of temperature changes seems to follow the rise and fall of sunspots, rather than the concentration of CO2 in the atmosphere. This further confirms what Heartland's Climate Change Reconsidered argues -- that natural causes have the dominant effect on Earth's temperatures, not greenhouse gases. Finally, the UN's own climate models project that if man's greenhouse gas emissions were causing global warming, there would be a particular pattern of temperature distribution in the atmosphere, which scientists call "the fingerprint." Temperatures in the troposphere portion of the atmosphere above the tropics would increase with altitude producing a "hotspot" near the top of the troposphere, about 6 miles above the earth's surface. Above that, in the stratosphere, there would be cooling. But higher quality temperature data from weather balloons and satellites now show just the opposite: no increasing warming with altitude in the tropical troposphere, but rather a slight cooling, with no hotspot, no fingerprint. So the scientific foundation for shutting down our modern, 21st century, industrial economy has been obliterated. But that is not stopping religious crusaders, due to the extremist ideology and special interests driving the global warming charade. Commenters, you can pass on the ad hominem attacks. No one is the least bit interested. Remember hurricane Katrina? The moment that big one hit the U.S. the doomsayers in the global warming movement said it was all about global warming. Well known alarmist Kevin Trenberth warned: "Computer models also suggest a shift in hurricane intensities toward extreme hurricanes." Trenberth, who was the main editor on hurricanes for the IPCC, wanted opponents of his theory left unpublished. He knew in his heart that hurricanes were increasing in frequency and intensity. Now, he did admit that this was true "even if this increase cannot yet be proven with a formal statistical test." Trenberth wrote in Science, that during 2004 "an unprecedented four hurricanes hit Florida... Some scientists say that this increase is related to global warming; others say it is not." "Thus, although variability is large, trends associated with human influences are evident in the environment in which hurricanes form, and our physical understanding suggests that the intensity of and rainfalls from hurricanes are probably increasing, even if this increase cannot yet be proven with a formal statistical test. Model results suggest a shift in hurricane intensities toward extreme hurricanes." Time Magazine ran a story headlined "Is Global Warming Fueling Katrina?" Ross Belbspan, in the Boston Globe wrote that while the hurricane "was nicknamed Katrina by the National Weather Service. Its real name is global warming." Hurricane Katrina was born August 23, 2005. It has been six years since the media was assuring us that global warming was driving hurricanes to greater intensities and frequency. According to the BBC, "The IPCC 2007 report claimed that global warming was leading to an increase in extreme weather, such as hurricanes and floods." They also noted that the IPCC reported was "based on an unpublished reprot which had not been subject to scientific scrutiny—indeed several experts warned the IPCC not to rely on it." The IPCC used the report because it substantiated the entire theory on which their very existence relies. And, a new hurricane record is about to be set—but not the kind of record you would expect from the dire warnings. The last major hurricane to hit the United States was Wilma which was formed on October 15, 2005. Since then there have no large hurricanes (categories 3, 4, 5) to hit the United States. This record will be 2,232 days from the last major U.S. hurricane. The previous record was a period between September 8, 1900 and October 19, 1906. So this record means we have just gone through a period of the least amount of severe hurricanes since a century ago. Roger Pielke, Jr. notes that the chances of an intense hurricane before next summer is practically zero, since hurricane season won't start until then. 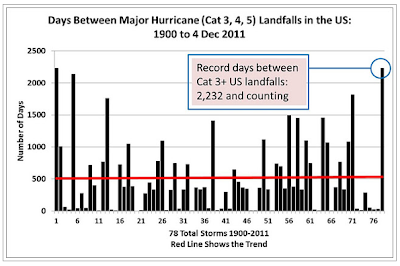 And he says it appears "the days between intense hurricane landfalls [are] likely to exceed 2,500 days." Of course, there is a decent chance that no severe hurricane will hit in 2012 either. But, we can't know until the winter of 2012. What we do know is that we have just gone through a period of the least intense hurricane activity in the memory of anyone alive on the planet today. This shocking threat is real. The new Climategate emails show clearly any unbiased observer that climate science has been ruinously corrupted by Al Gore, the UN and the massive global warming industry that they have created to enrich themselves. CFACT is leading the way in bringing these emails to the world’s attention. We’ll keep you posted. More importantly, we won’t permit the UN climatecrats, the climate research grant seekers, the radical climate campaigners and those eager to redistribute what you have worked for— to the whole UN menagerie of third world despots and corporations who want to keep cashing in on climate pseudo-science, propaganda and fraud. The entire global warming industry is in Durban, South Africa. They are smug. They expect to leave here with money for themselves … and less freedom for you. Stopping them is a Herculean task. We are making headway here. We will challenge them again and again. With your help. In the end. We will win. Science journalism is not about taking sides, or about being a cheerleader. It's about shaking the tree, about asking awkward questions, about standing in the place of those who can't ask such questions, and being persistent, unpopular and dogged. It's about moral authority, something science in BBC News has lost. There is no faster moving, more important, and vital area of human initiative than science. It's what feeds our bodies and our minds, clothes us and keeps us warm, prolongs our lives and extends our capabilities. No one who uses a credit card, a cell phone, takes a pill or just gazes at the stars can ignore science. It tells us our beginnings, and informs us of the promise and the pitfalls of the future. It can turn humanity into gods, and sometimes devils. If scientists take public money for their research they, individually and collectively, have an obligation to make some effort to communicate their work to their paymasters. But science, and communicating science, is too important to be left to the scientists. An essential component of the scientific enterprise is the science journalist, and there as the saying goes, we have a problem. There has never been a golden age of science journalism, but certainly there were more characters, better writers, more newsgathering zeal, and more originality in the recent past. I remember doing science journalism before the internet when we used fax, phone, crude email and ingenuity. Each science journalist on each outlet, be it broadcast or print, was working by the dead reckoning of their judgment. There was a lot of common ground in stories covered, and a lot of disparity making the competition more intense than it is today. The internet has seen coverage of science issues in the news media becoming more homogenous. Information is more readily available to all, not just a privileged journalist. It can travel faster, and it is easier to see what stories competitors are doing. The result has been that news outlets have become bland clones of one another, hardly adding much value over the equally accessible scientists own blogs or non-professional journalists, and real scoops are far less common than they were. The spectrum of stories being covered has narrowed to a worrying degree. Many survive as a science journalist just by paying attention to press releases and reproducing them, as long as others do the same. A recent BBC analysis of its science coverage in its own news reports revealed that 75% came from press releases, and only a tiny fraction contained views not expressed in those press releases. This lip service is not good enough, and editors should wise up that science journalism has lost its edge and demand reform. It has also become uncritical and therefore not journalism. Too many who profess to practice journalism are the product of fashionable science communication courses that have sprung up in the past fifteen years. It's my view that this has resulted in many journalists being supporters of, and not reporters of, science. There is a big difference. Many have become advocates for science that are too close to the scientists they report on. Anyone who has downed an orange juice at a scientists and journalists bash will not have to look far to see them compete to see who can be the most sycophantic. At one such gathering I remarked, tactlessly, that I was surprised, and disappointed, that half of the scientists there didn't hate half of the journalists! Scientists even run prizes for science journalists! Jonathan Leake, science and environment editor at the Sunday Times said recently, "Science in the daily media is too often reported in the same deferential way as political journalists used to report politics in the 1950s." Because of this back slapping closeness, many journalists lack detachment and by implication judgment about the stories they cover. Journalism is about not taking sides, or about being a cheerleader. It's about shaking the tree, about asking awkward questions, about standing in the place of those who can't ask such questions, and being persistent, unpopular and dogged. It's about moral authority, something science in BBC News has lost, and it's about old-fashioned scoops. It's not about being part of the spectrum of communicating science - which is something that scientists and non-journalistic broadcasters should do - it is a vital aspect of democracy. It is neither an extension of the scientific establishment, nor even its friend or on its side, and it is fundamentally different from science communication. That some active and contentious scientific topics, like climate science with all its unknowns, complexities and implications, are placed beyond debate because they are deemed "settled" is wrong. Good journalism is the antithesis of a crude expression like "we've gone beyond that" allied to an over simplistic view of science. Climate science in particular is reported far too narrowly with much important peer-reviewed research ignored, and with environmental reporters far too concerned with doing down those they define as sceptics. Forget the sceptics, just report the science properly. It will all come out in the wash.
Science and science journalism are needed. Journalists should portray where the weight of evidence lies, but that is the least they should do, and they should not look to scientists for guidance anymore than an artist asks a bowl of cherries for advice about how to draw them! They should criticise, highlight errors, make a counterbalancing case if it will stand up, but don't censor, even by elimination, don't be complacent and say the science is settled in areas that are still contentious. The history of science and of journalism is full of those reduced to footnotes because they followed that doctrine. QUEENSLAND'S summer cold snap has turned into a record-breaking streak, with a string of southern and western towns recording their coldest December days in years - some up to 15C below average. It came as forecasters predicted almost a month of wet weather, running through Christmas to at least January 3. And it's already started with rain falling over the southeast this morning. Brisbane is predicted to reach a maximum of 23C today – well below the December average of 29.4C. Coolangatta yesterday dipped to 20.7C, its coldest December day in 46 years. Applethorpe, on the Granite Belt, dropped to a record 13C, breaking its previous coldest December day in 1986. Nearby Stanthorpe had a top of 13C. Its previous record was 13.1C, also set in 1986. Balonne's previous all-time low of 18.4C, recorded in 1975, was surpassed at 3pm yesterday when the southern town registered 17.5C. Weather bureau climate scientist Jeff Sabburg said days of cloudy, windy and rainy conditions had produced the low temperatures. "It's quite amazing," Dr Sabburg said. "We are close to, or have records broken at, quite a number of places. A lot of it is down to this cold air coming in from the south." In Brisbane it also was doona weather, with temperatures dropping to 17.9C overnight. With a wind chill and low humidity factored in, the city made a low of 16.4C. Other places at record or near-record lows were Toowoomba, Thargomindah, Texas and Goondiwindi. Forecaster Peter Otto said Brisbane was about 2C below average overnight. Although the south was hit hardest, the cold patch affected much of the state, with Mount Isa 4C below average, Cloncurry 5C below and the Maryborough region 6C to 8C below. It's shaping up to be the coldest start to summer in more than 50 years. If forecasts prove accurate - and Sydney stays below 23 degrees until Wednesday - it will be the coldest first week of summer since 1960. It's already the coldest in 44 years, Josh Fisher, a senior meteorologist at Weatherzone, said. In the summer of 1960, each of the first 10 days was cooler than 22 degrees. Meteorologists blame cold winds, sweeping up from near Tasmania, for the unseasonable weather. Today's forecast temperature of 18 degrees is seven below the average for this time of year. The additional chill brought by projected 30-40km/h winds will make the city feel like 11 degrees, Mr Fisher said. Sydney should warm to the mid-20s on Friday and next weekend, the eight, ninth and 10th days of the month, Weatherzone meteorologist Brett Dutschke said. But it won't be a sunny reprieve. The Bureau of Meteorology is forecasting rain and cloud. The city's long-term average maximum for this time of year is 25 degrees, Mr Dutschke said. Mr Fisher also said summer would be cooler than average because of the influence of the La Nina weather cycle, which brings with it greater chance of clouds, rain and humidity. "Looking further ahead, the summer as a whole is likely to be close to or cooler than average, regarding maximum temperatures. We will still get our hot days but La Nina will increase the chances of extra cloud, humidity and rainfall, hence cooler daytime temperatures," Mr Dutschke said. Thunderstorms rolled across the city late yesterday morning and early afternoon, cooling most suburbs below 17 degrees, well below average for this time of year. The storms also brought brief rain and hail to some western and northern suburbs. Picnickers and beachgoers were sent scurrying. The NSW Greens have abandoned their official support for an international boycott of the state of Israel, a policy that drew unprecedented ire towards Marrickville Council this year and exposed broader rifts within the party. At a State Council meeting yesterday, which was not open to the media, every local Greens group voted to support a revised motion which recognises the Boycott, Divestment and Sanctions (BDS) campaign as a legitimate political tactic, but to abandon it as an official party position. The policy provoked a huge backlash from Jewish groups and some sections of the media when it was adopted in-principle by Marrickville Council last December, with support from Greens, Labor and an independent. Some Green party members, including Bob Brown and MLC Cate Faehrmann, blamed the policy for contributing to former mayor Fiona Byrne's unsuccessful tilt at the seat of Marrickville in the March state election. Immediately after the election, the council abandoned the policy when two of the Greens on the council split and voted with others to overturn it at a dramatic meeting. Greens MLC Jeremy Buckingham more recently criticised the targeting of Israeli-owned Max Brenner chocolate shops by BDS protestors. In May, the party convened a working group of about 25 people to reconsider the divisive policy. Their report provided the basis for the revised position. Ms Rhiannon, a strong proponent of the policy over the last year, denied the policy had exposed a rift within the party, and said a consensus view had now been reached. “The resolution recognises the legitimacy of the BDS as a political tactic and also recognises that there is a diversity of views in the community and the Greens,” she said. “While there have been a variety of views among Greens members on BDS there was strong and united commitment to continue our work for Palestinian human rights. The BDS policy had drawn high profile support to the party and Marrickville Council too, with Bishop Desmond Tutu and human rights advocate Julian Burnside QC sending messages of support. The motion adopted at yesterday's conference reaffirmed their position that the Australian government should halt military cooperation and military trade with Israel and resolved that the party would also work to develop a broader ethical procurement policy. It also recognised the right of individual Greens members to participate in BDS campaigns.